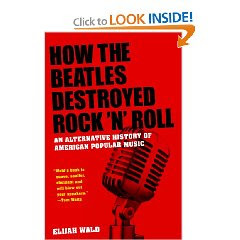 Elijah Wald's book How the Beatles Destroyed Rock n Roll: An Alternative History of American Popular Music is a must-read. Well-known musicians concur as well. Wald provides a most gripping analysis of the history of rock and how it shaped many of our attitudes towards music and various musical trends throughout time during the 20th century. If you're interested in the history of music and the role that rock 'n roll plays in our lives, this books needs your attention. The wonderful stories and vignettes Wald provides are imagination-capturing. I very much doubt you'll have the urge to stop reading. We're looking good this summer, btw. BK tells me you've been traveling a lot. Noted and added. Cool, needed a new book to take on my trip.